Sylvanic.com was created on November 29th , 2004 by Todd Standing, a relative unknown in the Bigfoot research field. It wasn't for almost six months later in May of 2005 when the site became live. The first indication was the very melodramatic introduction Standing gave the site. Over the past few years both Cryptomundo.com and GhostTheory.com have featured the antics of Sylvanic.com and Todd Standing in the past calling them for what they are. For example Todd Standing owns a Commercial Production Company, called "OutSTANDING Productions." It is bizarre though that both Todd and his sister, (whom appears to be a partner in the venture) both use aliases. Standing, uses the alias "Todd Rockwell" and his sister Louise Standing, uses the alias "Louise Greene." Could it be a marriage name in her account... absolutely. However her personal website, louisestanding.com, she uses the Standing surname again and admits to being part of Outstanding Productions. Strange how they are working with aliases. More recently, this alias has been confirmed by Standing and the link between OutSTANDING Productions and Sylvanic.com is now public knowledge. Todd Standing has been tied to this ad, as someone (our friend "Pragmatic Theory") had an old copy of Sylvanic's Domain registration. Note the phone number in the ad compared to the Admin contact for Sylvanic.com. There was another prevailing theory that the name Sylvanic, may have been derived from a Latin word, meaning forest. While I'd like to give Mr. Standing credit for being that educational, however the source of the name may be a simpler one. Todd's mother's name is Sylvia. There is also a Sylvan lake nearby as well. Any one of these could be where the name comes from. Video 1: The narration by the woman on the tape seems a little canned. The camera appears pretty steady for being startled as well. Click on pic to view video. In 2006 - 2007, there was a push by Standing, to have Bigfoot / Sasquatch put on the Canadian Endangered Species list, which ultimately failed. Many in the Bigfoot research community saw this as a publicity stunt. However during this time period the story of the four missing college students, the recovered one Dan Hamilton and the first Sylvanic movie disappeared from sight. By this time in the field, many already suspected due to Standing's dancing around certain questions, inconsistencies in how exactly get to Sylvanic, but yet offering no proof of his claims other than stories, and another video, dubbed Sylvanic Video 2. 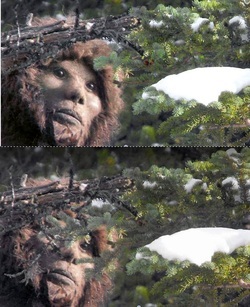 2010 Picture of a "Sasquatch"
I do not think a huge soliloquy is needed for these pictures. It is obviously not a biological figure. 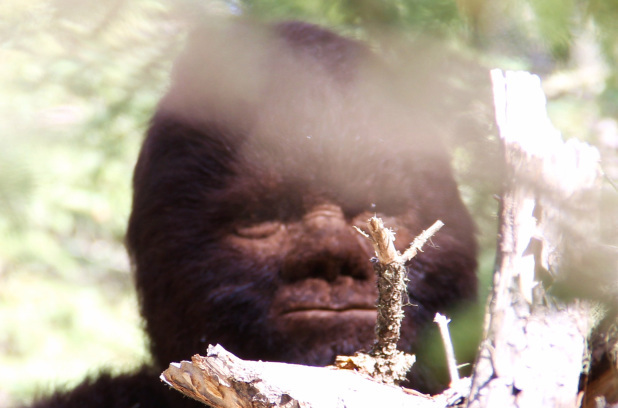 Released in October 2010, by standing of an alleged Sasquatch. Looks more like a figure from a museum. It clearly reveals layer manipulation. We will have much more on this shortly!